The Second Edition of the book encompasses two new chapters--Strategic Cost Management and Business Ethics--A Strategic Financial Management Instrument. The book, being an augmented version of the previous edition, equips the young managers with the fundamentals and basics of strategic management and financial management in a cogent manner. The text now provides a better orientation to the students on the topics like corporate restructuring, divestitures, acquisitions, and mergers in the global context with the help of examples and caselets. The book has been revised keeping in view the requirements of postgraduate students of management and the students pursuing professional courses such as CA, MFC and CS. 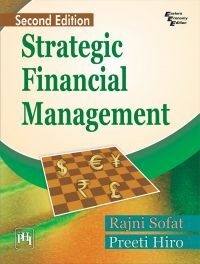 In addition, professionals working in the corporate sector may also find the book beneficial to integrate the financial management functions into business strategy and financial operations. • Model question papers have been appended at the end of the book. • Better justification of topics by merging the contents wherever required. • Theory supported with caselets inspired from global as well as Indian context. RAJNI SOFAT, PhD, is Senior Faculty of Finance in the Department of Business Administration at Guru Nanak Institute of Management and Technology (GNIMT), Ludhiana, Punjab. Having twenty years of academic and research experience, she has also presented several research papers in seminars and conferences, and has contributed many articles to reputed national and international journals. Dr. Rajni Sofat has also been awarded with the prestigious Rashtriya Gaurav Award and Certificate of Excellence for her meritorious services and outstanding role in the field of academics, besides being the nominee of many other prestigious awards like Sadbhavana Award, Rashtriya Ekta Samman, and Best Citizen of India Award.|PREETI HIROis Assistant Professor at Guru Nanak Institute of Management and Technology (GNIMT), Ludhiana, Punjab. She has more than ten years of experience in teaching and industry. She has published several research papers in reputed journals, seminars and conferences.